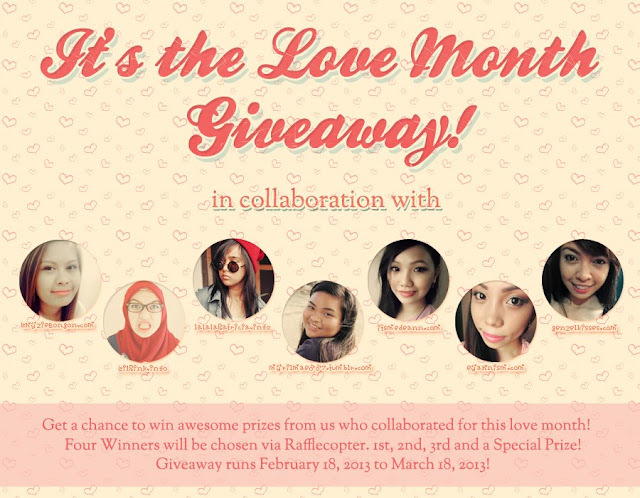 It's the Love Month Giveaway brought to you by 7 gorgeous ladies! As promised another giveaway and another set of gorgeous ladies who collaborated just for you guys! You're lucky enough ha? Yay! So are you ready to know what sweet prizes awaits you this love season? Well let's get it started! It was indeed sweet and pretty prizes right? So what are you waiting for? Try your luck and you might be one of the lucky winners! Thanks for supporting www.lalalapatricia.info all throughout! This giveaway is for you. Good luck to everyone! Xo, lalala.